Oh, pardon me, I’m supposed to be fighting Flash Gordon. Originally with Masters of the Universe Classics I was not intending on being a line completist. There was no reason to: with the poor Australian-to-American dollar conversion rate, and the difficulty in buying ordinary characters who sold out within minutes (grrrrrrrr) there was no point trying to be an obsessive. Fortunately, as the Australian dollar improved, MattyCollector picked up their game and made it possible to acquire any of the toys I wanted. 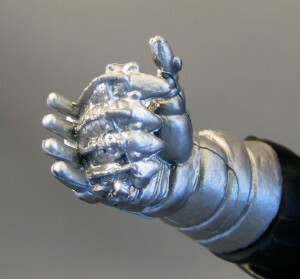 My personal philosophy when it comes to collecting toys is that collectors should have the toys they want available to them, and at a fair price – exclusivity rarely makes things better for collectors, which is why I was frustrated when MattyCollector made Shadow Weaver the exclusive subscription figure for this year. I hadn’t intended on subscribing – I very much dislike the notion of having to buy toys I don’t want just because I’m locked in for a sub, but 2012 has actually been a really good year for MattyCollector products, which led me to get all of the subscriptions. I’m not sure whether this will continue for next year’s, specifically because of the more undesirable offerings; for every Ram Man, there’s a Fighting Foe 3-pack, a particularly expensive set that is to me even more undesirable than the Star Sisters (who at least bolstered my POP ranks). Although I have the vast majority of the MOTUC, to say I’m a completist is a bit of a misnomer – there are some toys that were just too unlikeable to make me buy them. As nostalgic as I am for Masters, my knowledge of the universe only goes so far, so there has to be something more to sell me on characters I’m not already familiar with, and that is the quality of AWESOME. Draego-Man, for example, has that quality in spades. He’s great. I never had any knowledge of the Space Mutants, but characters like the giant eye guy, and the slime-headed thing with the tentacles, are awesome enough that I’d buy them regardless of what line they came from. And so, today, we come to another toy I have no prior knowledge of, but like just because he’s darn cool. 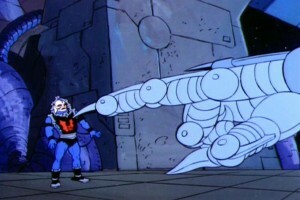 So this guy is one of the Big Bads of the MOTU universe, an authority over Hordak, the resident antagonist of POP. That’s enough for me! The packaging is the same as the rest of the line, with the required “Evil Horde” sticker adoring the front. 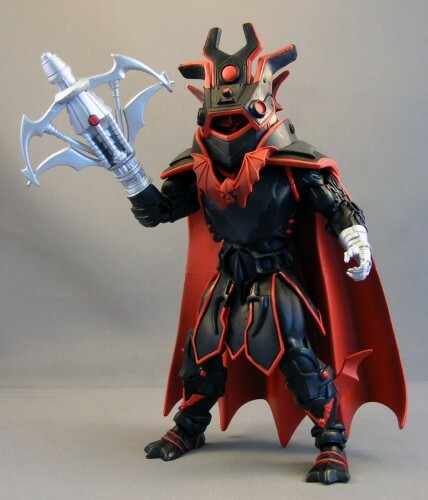 Horde Prime’s sculpt is excellent, building upon the design of Hordak with the same black-and-red color scheme that looks more armored, more technical than the simpler Hordak. The entire toy is basically black and red, which looks great – he’s got a really unique look that makes sense and is incredibly pleasing to the eye. 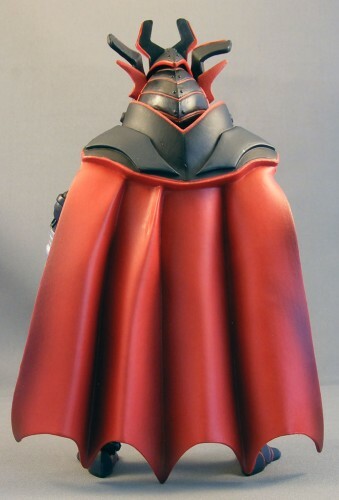 The color scheme is shared by his long flowing cape, attached by the Horde insignia that graces the front. Ditto his huge helmet, which I’ll get to in a moment, but notably makes him much taller than the average MOTUC. This is important in drawing attention to his status and threat to the universe, and it’s really cool design. He shares his grand articulation and durability with Hordak, with balljoints at the shoulders and hips, hinge joints at the elbows, knees, ankles and abdomen, and swivels at the biceps, wrists, waist and calves. When it comes to accessories, Horde Prime is superb: he features his two interchangeable heads, which I’ll get to in a moment, as well as his removable helmet/headgear thing, and a crossbow. 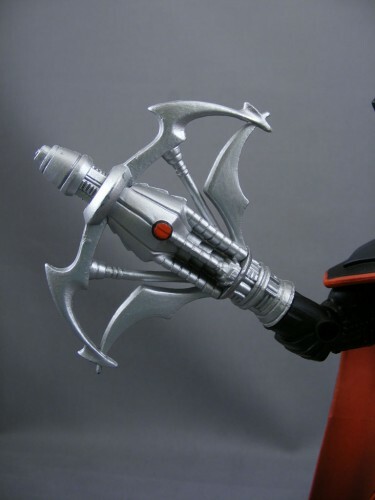 That crossbow is really cool; pulling off Horde Prime’s hand means you can stick that on via plug, giving him the same look as Hordak’s transforming hand-to-weapon thing from POP. It’s really nicely painted and detailed, a nice change from the single-color weapons we’ve seen before, and makes him look really awesome. The removable helmet thing, which conceals his SUPER SECRET FACE, is equally as cool: the character appears to be wearing some kind of heavy armor, with a technological edge that reminds me of the style of Tron, or perhaps the headgear worn by the female krogan from Mass Effect. Horde Prime and the Grand Nagus: Separated at Birth? Now, with little familiarity with the character and no desire whatsoever to fumble around on He-Man forums, I don’t know what the deal is with the interchangeable heads. * Included in the package is a very weird cat-type head with yellow eyes and a stupid red helmet with antenna, which looks stupid off and on the action figure. If Horde Prime himself has antenna, then why would they be extruding from his helmet instead of just his head? Or if they’re part of the helmet design, why would he want to look so silly? He has pink under the eyes like he’s wearing make up on his cheeks, and unpainted facial hair that extends to below the head like a second set of antenna. If you have any interest at all in making Horde Prime look “not dumb” this head goes straight into the accessory drawer, never to be seen again. The SUPER SECRET ALTERNATE HEAD is hidden beneath the headgear in the package, and it’s much cooler: although I won’t reveal it here for those who wish to avoid spoilers, it looks really impressive and adds to the bio story that Hordak is Horde Prime’s brother, or that they’re from the same evil race, or whatever. So Horde Prime is another great addition to the series, and really makes me wish we’d seen a Horde Trooper two-pack for next year’s sub, as to continue padding out the ranks of the Evil Horde. 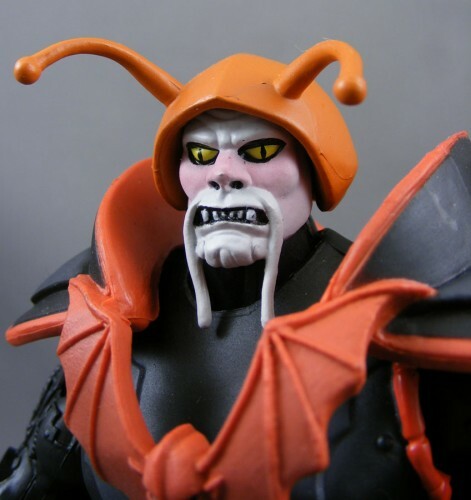 With the unhappy possibility of the MOTUC line drawing to a close, let’s hope that Mattel can complete the line with most, if not all, of our favorite characters as well as desired army builders and the occasional awesome unknown. 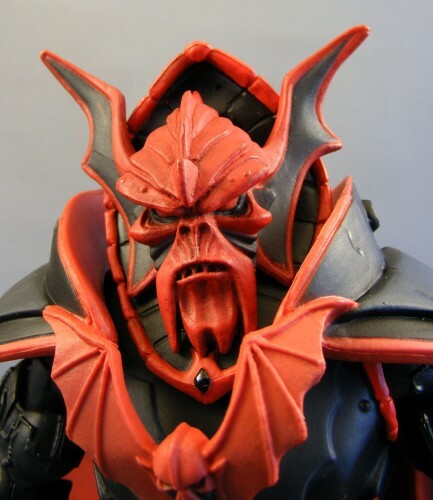 * Poe’s note: the second “catfish” head is based on Horde Prime’s depiction in the U.K. MOTU/POP comics. This is a slightly altered version of a review that first appeared on OAFE.net on 7/23/12. Oops, you didn't mean to reveal the face but did? That's okay, it's the first time I've seen the hidden face and it makes me want this figure! Yeah, but then having "I won’t reveal it here for those who wish to avoid spoilers" is kind of past sarcastic and into "did they forget to proofread?" territory. Ah yes, THAT would, as you guessed, just be lazy editing on my part. Ahem. Yeah, I think that's what threw me off, lol. 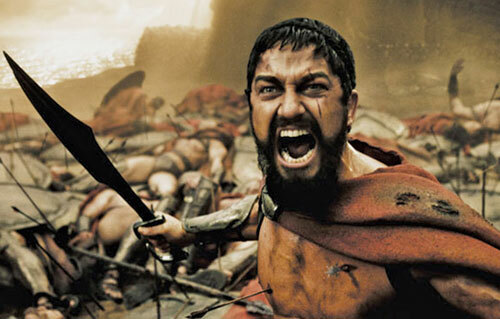 That face is AWESOME. I want to buy this thing now and display him without the helmet. It's kind of exactly how you would expect him to look, but it's fantastically done. I'm kind of in shock now. I think the UK Horde Prime face actually threw me off buying the toy, as it looks dumb and I didn't realize there would a totally different head under the helmet. Now I want. Yeah the UK Head is definitely stupid looking, but I think it's kind of a fun accessory. There's no debating that the money spent creating it could've been better spent on more accessories, or a better alternate head though, and it'll be going straight in the accessories bin for me. The more I think about it, the more I’m pretty sure I’m going to put the UK Horde Prime head on Cy-Chop. The helmet would match the belt and hands better I think. That's a reallygood idea. The colors do match much better. Plus, it'll enhance the whole "lobster" theme…heck, the U.K. Horde Prime head looks more like a crab/lobster than Clawful's own head. 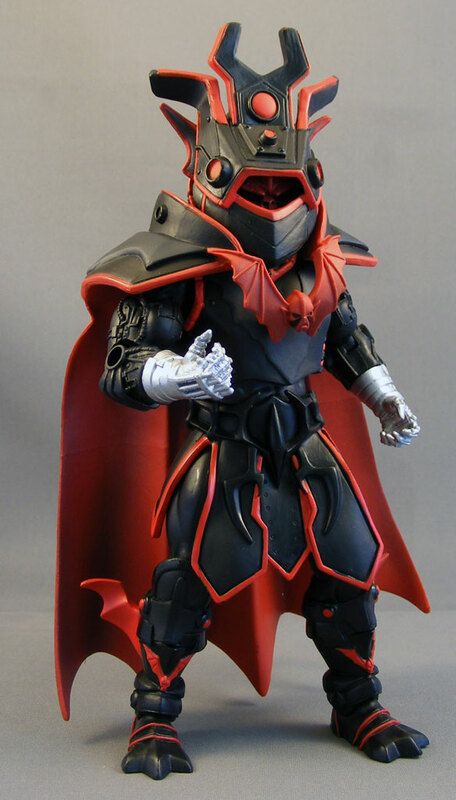 pretty much the ONLY thing that I'm not super-jazzed about is the red color scheme of the face, though it's a good way to differentiate from Hordak.